Buy Early and Save on select nights in September & October to Mickey’s Halloween Party at theÂ DisneylandÂ® Resort.Â Cardmember tickets start at $44. Bring your boys and ghouls to dress up and trick-or-treat throughout the ultimate Disney neighborhoodâ€”DisneylandÂ® Parkâ€”duringÂ Mickey’s Halloween Party! Scare up some fun with Mickey during hisÂ private Halloween bash! Satisfy your sweet tooth as youÂ trick-or-treat throughoutÂ DisneylandÂ® Park and collect yummy and healthy snacks. A Mickey’s Halloween Party exclusive. 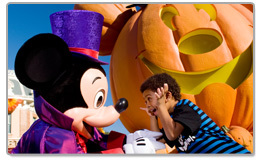 Admission toÂ DisneylandÂ® Park up to 3 hours prior to Mickey’s Halloween Party start time. Early access to Park begins at 3pm on Monday and Tuesday nights and 4pm on Friday nights. Meet Disney Characters in their Halloween costumes and watch them parade down Main Street, U.S.A. Enjoy themed dance parties, take photos in front of fun Halloween backdrops and much more! Halloween Time is wicked fun for everyone. From September 16 through October 31 at theÂ DisneylandÂ® Resort, the spirits of the season are everywhere! Take a spine-tingling journey throughÂ Space Mountain: Ghost Galaxy and creep on over toÂ Haunted Mansion Holiday, inspired by Tim Burton’s “The Nightmare Before Christmas” andÂ Twilight Zone Tower of Terrorâ„¢ to see their seasonal makeovers. And your kids will love aÂ Character Meet ‘N’ Greet, theÂ Main Street Pumpkin Festival and more!